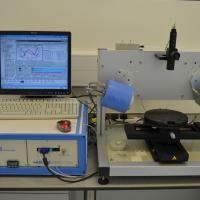 This equipment has a spectroscopic source and operates between 400 and 840nm. The software is fully configurable to enable the measurement thickness and optical properties of the thin transparent films encountered within the cleanroom such as Silicon Oxide, Nitride and Oxynitride, organic layers like photo and electron Beam resists, and thin metallic layers. Multiple film layers can also be measured. The stage is a controlled XY table capable of handling wafers up to 150mm, so mapping recipes can be created. Minimum measurement area is 4x2mm.